Who came up with the Bond Method, the Bond Test, or the Bond Hypothesis? I'm not sure, but it may have been this guy, John Kefuss. Take a few minutes and read this article. It will be worth your time. Do you ever get that feeling when someone puts something you have been thinking about in to a nice neat concise terminology that makes sense and summarizes your thoughts into a cogent concept? I do, all the time. It’s okay though, I don’t have to put a name to everything I think about. But I can innovate and modify it. The same thing happened recently at NEOBA’s Big Bee Buzz. 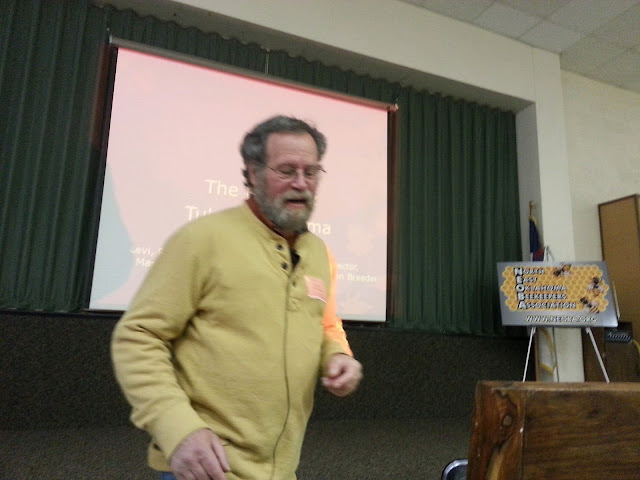 I was enjoying a presentation by Sam Comfort, a beekeeper of some renown who keeps bees in a bit of an unconventional way. His current push is for box hives. He is also big into topbar hives and even calls himself a bartender. Hilarious, you had to be there. I have been suggesting for some time that to succeed in treatment-free beekeeping, one needs to understand how to increase, growing one’s own queens and though I don’t use the term “outbreed the mites,” it does work. I have found that it takes several years of outbreeding the mites and then at some point, the bees quit dying in large part. Don’t confuse outbreeding the mites with causing brood breaks, I don’t rely on brood breaks for mite control. So my idea is to focus on perfecting rapid expansion methods rather than spending time studying about what treatments to use, how to use them, and burning money on them. And I’m going to call it Expansion Model Beekeeping. Sam thinks it’s a good idea too. He said it first. Full credit to that. A far better investment than any treatment is a queen castle. I have been promoting queen castles since I found them. They are hives where one essentially divides a full size box into two or three frame nucs and then uses those nucs, with full size normal frames, to raise queens, either as traditional mating nucs, or as a place where one can put a swarm or supersedure cell with its frame and bees to hatch out and mate and found a new hive. Small hives like this are machines, excellent at rapid expansion, comb drawing, brooding, and growing. They can quickly be moved into a larger nuc or used to requeen a lackluster hive whose main problem may be disease issues. If caught in the right time, a hive preparing to swarm can yield as many as a dozen new queens and nucs, but only if you have the equipment to put them in. 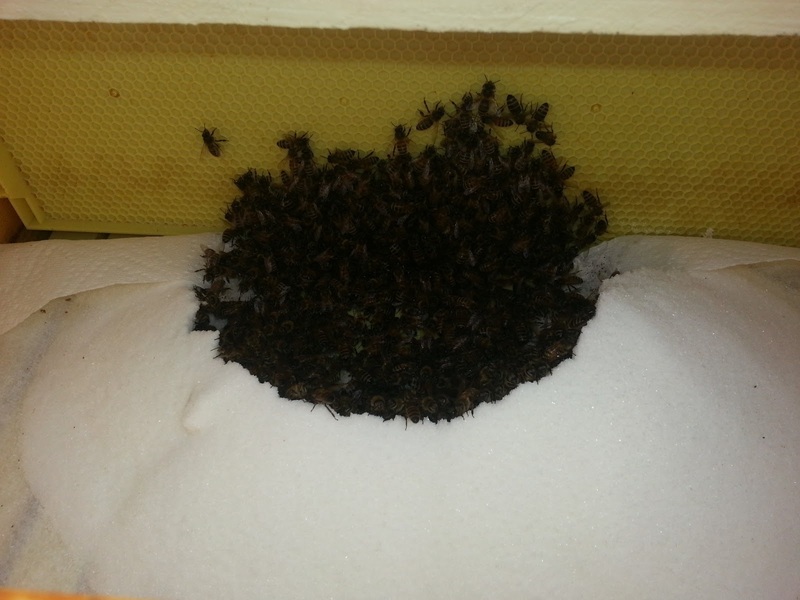 If managed to produce queens, a hive can produce dozens at a time, every few weeks. Queen castles can turn all these queens who successfully mate into new hives. These new hives draw comb and expand at an amazing rate. At the same time, you are placing firm selective pressure on these hives to deal with and survive mites and other maladies. In just a couple generations, diseases are no longer a major problem in your day to day management of hives. With more selection techniques applied to the resulting queens, you can do the same thing with gentleness and productivity. But this isn’t a quick ‘take two and call me in the morning’ solution. It’s not a treatment, something you can toss money at and expect miracle results. Treatments don’t produce miracle results anyway, but that’s a topic for another day. This is something that takes learning and as I’ve said often enough before, you gotta jump right in. Timidity at the beginning often ends in failure. We’re working with bees who’ve for the most part not been bred for survival, instead relying on treatments to keep them alive and focused almost solely on production. Furthermore, mass numbers of bees, queens, and nucs, are shipped out of the south every year because people demand early queens and packages and nucs. But these bees are not accustomed to your climate. Their mothers just survived a winter that looks more like your Halloween than the proper winters you’re accustomed to. And this is the case for just about everyone north of 35 degrees latitude which is a major portion of the population. If you’re getting bees from the South, your bees are not accustomed to your conditions. This leads to common problems like when bees starve to death inches from capped honey. For some ridiculous reason, this common problem is pawned off on mites or some other disease. I had it happen a fair number of times and always to bees originally raised in climates with milder winters like California or Georgia. It’s an unacceptable condition and it can be avoided for the most part by maintaining bees well adapted to your conditions. The idea behind this whole philosophy is operating, at least for now, like you want to be a commercial beekeeper in five years. The focus is increase. Pretty quickly as I’ve found out, the bees quit dying out so much. Now I’m at the point where I have the number of hives I want to have. I have the volume of equipment that I can sustain. So what do I do with the extra bees? The first thing you can do is continue to develop strong, gentle, and productive bees. You can do that by continuing to breed or split from your best queens and requeening poor performers. If you have extra at the end of the year and don’t want to overwinter a certain number, combining is easy by killing off the less favored queen and placing her hive on the better hive. There are various ways to do that, newspaper combines and the like. You can keep some hives as nucs and they can be used to draw comb without feeding, or keep queens in reserve. Another thing you can do is use your bees to make a little more money or give gives or use them as trade. You can do this by raising queens, selling nucs, or selling packages or shook swarms (packages with their original queen). Maybe you don’t want to ship or sell out of town, but you can help your friends and neighbors get started. Form small cooperatives where you can rely upon your neighbors to provide you a frame of brood to restart a hive with a missing queen, or market your honey together. The ultimate goal is beekeepers whose bees don’t die in large numbers and who have a strong support group to help them grow and learn how to keep bees without resorting to medicating them or expending large amounts of energy trying to keep them alive. They should stay alive on their own and leave you the beekeeper to do the things you started beekeeping to do. Big Bee Buzz, Closing Thoughts, Where do I Go from Here? The Big Bee Buzz put put on by NEOBA was again a fantastic event. This year's festivities were a substantially treatment-free themed affair. It was so much fun, I got to meet and hang out with Sam Comfort, got to hang out with Michael Bush, and got to know Ed Levi (former Arkansas State Bee Inspector) better. So what did I take away? Some context. Everything I say is from the perspective of someone who is a Bond method beekeeper, and quite evangelical about it. I believe people should raise their own bees. I firmly dislike monoculture and the migratory beekeeping that enables it. My focus is pretty strictly on small beekeepers, backyard beekeepers, hobbyists, avid hobbyists, and sideliners. The new name I am using for my philosophy which I got with permission from Sam Comfort is Expansion Model Beekeeping. My twist is this: As a beekeeper, rather than spending a load of time learning about all the treatments, what they do, how to use them, all the mechanical and cultural methods of controlling mites, brood breaks, screened bottom boards etc., rather than putting energy into learning and internalizing all that stuff, learn how to breed and expand and to outrun the mites. And the thing is, outrunning them is only necessary for a relatively brief period of time. Once your local and localized population becomes sustainable, the mites are not a problem at all. Focus on creating and maintaining a population from which you can lose a few and not have coronaries about it. It's no big deal because you'll just raise some more in the spring. The last two years, I've only lost a single hive. That's after three years in this location with some higher losses, but a no point was it unsustainable. And with the methods that I have discovered and implemented now, I could have done it without buying new bees or queens. Run your operation, whatever size, on an expansion model rather than trying to maintain some certain benchmark. Hives are much easier to reduce in number than increase. A handy trick I learned from Mike Bush was when a queen flies off, to dump some bees on the topbars of the hives. They will begin scent fanning and she'll have a better chance of making it back to the right hive. Something I have been convinced to do is register my bees. I had been concerned that some inspector was going to tell me that I had to treat them. Ed Levi calmed my fears and said that they can't do that. The only thing they can do in Arkansas is burn them if they have American Foul Brood. I'm not so concerned about that. I've never had foulbrood and if I did, burning them is probably a good idea even though every deep box costs about $30 and every medium box costs about $25. It could get not cheap but it would be even more not cheap if it were allowed to spread. Anyway, the biggest benefit of registering and getting inspected is that I can ship queens and bees around. 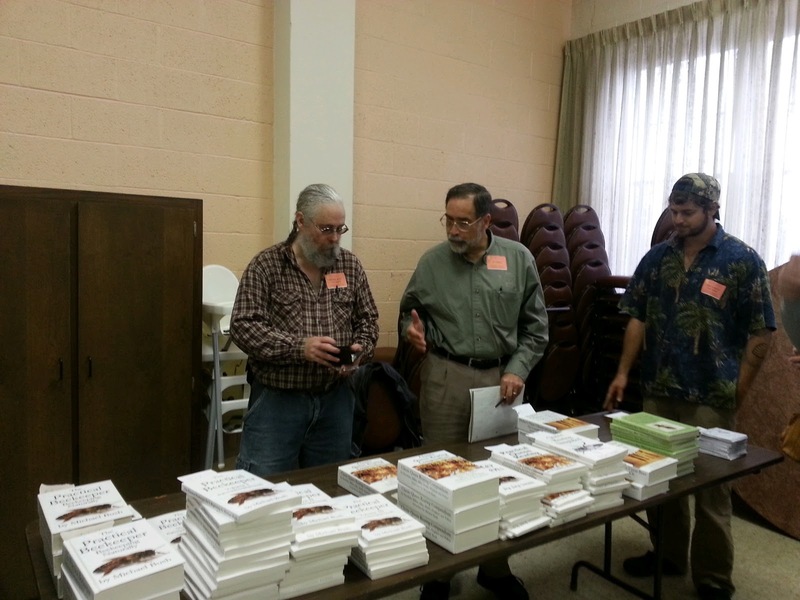 I'm also going to start going to the Northwest Arkansas Beekeepers meetings. I need to learn more about my area and get to know the local beekeepers. Sam thinks I should move up to 100 hives, but I doubt that's going to be happening any time soon. There's other things I like to do too you know. From talking to him I will also try putting my entrances somewhere in the middle of the hives to hopefully keep the brood and pollen separated a bit better from the honey. Ed does a talk every year about his travels. He travels the world consulting with NGOs about expanding beekeeping in mostly third world countries. Again I can't do it justice here because it's mostly pictures, but there were a couple very interesting points. Our modern high production methods of producing honey and bee products have not yet reached many of these places. They tend to have been in traditional methods, robbing and destroying hives to get the honey and drastically reducing production possibilities. These methods self select for bees that produce as little honey as possible, swarm constantly and are mean even though the African bees they were talking about were not particularly mean at all. That was Ethiopia. Next he talked about Ukraine. He was a consultant for Heifer Project International, an NGO which I use to give beehives to people in the third world. The most interesting thing about the next trips is that he took some beekeepers to visit a beekeeping village and they thought the whole thing was a front, a fake put on as propaganda. They did grow up under the USSR so I guess that can be forgiven for the time being. Small cell comb is recommended for experienced beekeepers. Oh yeah? I'm not sure if anyone told me at the time but I started in on it wholesale. What was I thinking? I don't know, but I'm glad I did. A lot of what I do goes like that, don't think too much about it, go on your intuition and sort it out afterwards. I wanted to be successful and Dee Lusby was successful, so I did what Dee did and I still do. Here's a concept that Sam introduced me to this weekend: maybe it's not the cell size that does the mites. Maybe it's the stress that is the cause of problems and reducing it is the solution. Severide's Law: The leading cause of problems is solutions. Foundation is a solution to bees building comb willy nilly, but it also causes its own problems. Mike reports natural cells as small as 4.4mm to 5.1. 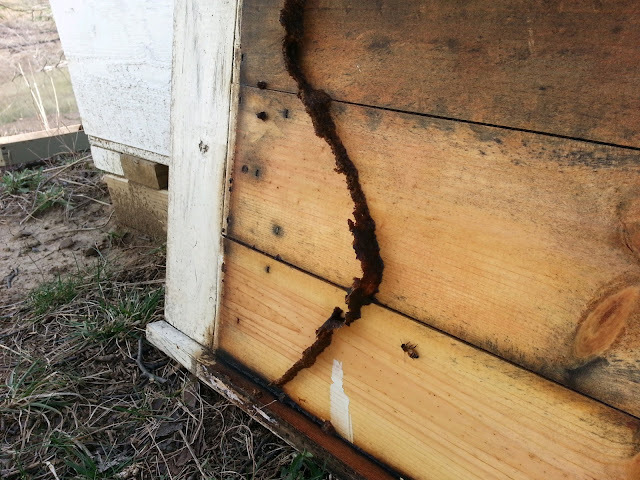 In my own hives I have seen with my foundationless frames 4.9 to 5.2. The bees intent is what they draw. They biologically need to have a certain proportion of workers, drones, and honey. And the proportion changes at different tiimes of the year. Manipulating the spacing can encourage the bees to draw a different size comb. Standard frame spacing is a compromise between honey and brood spacing and ends up being about drone spacing. Larger foundation they draw just fine because it's a bit larger than worker and smaller than natural drone. Regressing takes time and several steps. Iregressed from packages and didn't ever start out with large cell comb or contaminated comb. I've never treated ever. In natural hives, there is no single cell size. Any chosen size will be a compromise between something and something else. Reducing the capping time reduces the number of mites that breed in a cell. Natural bees have more hygienic behavior. How much does small contribute? No one knows. There is nothing UNnatural about small cell. Conventional cell size is certainly too large. Queens prefer natural comb to anything else. This is a great term and description for a philosophy behind treatment-free beekeeping. Remind me to write about it later. Sam has a great story. I can't do it justice here and there's no way I'm going to try to translate the whole thing to to text. He has given this presentation before, and you can find it around the internet. I will try to find a link to a video of it and post it here. Wax absorbs a bunch of chemicals because it is lipophilic. Here's a nifty tip: if your queen flies away, which happens occasionally, pick up a frame and dump the bees off it. They will start fanning with their Nasonov pheromone which will be like a beacon. People talk about how they had bees and they did everything they could and treated and everything. Maybe you killed them! The only workable solution is breeding to replace losses rather than trying to prevent losses. In the long run, you will lose fewer. Breed your own queens! The only way you are going to get bees that survive your winters is to breed bees who survive your winters, not bees from Alabama and California. If you can get queens this time of year, it means they will be from the south and they won't be adapted to your conditions. By not trying to get bees early, you can raise them with proper timing and with with proper nutrition so you get a good quality well mated queen. You have time to make a quality queen and not pull her out of the mating nuc too soon so that she doesn't develop properly. Save money!!! Spare queens, i fyou need one, she's there. Most importantly, it contributes to maintaining the overall diversity of the species. The kick test: If you walk up to the hive and kick it and they come pouring out, requeen them! Sugar syrup off balances the pH and microbial culture in the hvie causing more brood disease. It's ntot worth the effort anyway. Robbing, drowning, work, travel, etc. Forget the pounds per hive, figure your pounds produced per hour of work. Fourth step: Natural comb. Bees have been enlarged. It's better to let them build their own size or put them on a more natural size. Killing drone comb selects for varroa that likes worker. Fantastic talk, full of practical information. In this presentation, Mike started out by talking about how ther is a natural super organism in the hive of honeybees with dozens of larger creatures and 8000 microorganisms. Feeding essential oils and anything that kills microorganisms disrupts the system and causes imbalances and can actually cause more more problems. Terramycin and other anti-biotics actually cause the diseases like American Foul Brood because they also eliminate the organisms that compete with the organisms you're trying to kill. As long as you keep treating, you don't have selective pressure for the bees to breed their own resistance. Treating creates super pests and wimpy bees! Ed Levi gaive his short presentiation again about the bee informed national partnership, a national survey. Please participate at beeinformed.org. It helps to know what other beekeepers are doing and whether or not they are being successful and what methods are being successful. Sorry about the quality of the last few posts. Later when I have a better machine, I'll clean it up and embellish a bit. For some reason, this blogger interface does not agree with my phone and doesn't let me put in returns or really tries not to allow it. So I'll have to come back and fix it later. More great presentations are sure to be given today, so stay tuned. They are videoing the thing and as soon as I find their location, I'll post them. Our own morale raiser, Sam is a backwards beekeeper. He doesn't treat with anything, and he'll build a hive out of anything. After a rousing song which I will post later, he started into to People Collapse Disorder, talking about the problems people are causing with the bees. It's really conditions people create that cause the bees problems. Sam then went into how he keeps bees now, talking about about his hives, cell size. Like me, he is of the opinion that package bees are not a good plan because they die. He talks about how varroa and other diseases are symptoms of a deeper problem. The bees are out of balance. It's the stress that is causing many of the other problems that are treated rather than fixing the actual problem. No heavy lifting in topbar hives. Brood will be toward the entrance and honey away. With a topbar, you're only opening a very small part of the hive rather than the whole top. The one downside to topbar hives is that they need more regular maintenance so that the combs don't get crooked. To make honey you need to open up the broodnest or they will swarm. Bees are not like cows. They retain a deep wildness. After becoming the biggest topbar hive beekeeper in the country, he decided to do some other things like experimenting with Warre hives. How do you get into bees? Buy nothing! Make hives from scraps, catch swarms. Continuing on after my phone is not cooperating, Mike is talking about frames and how he switch to foundationless frames which were made with a V on the underside of the top bar. As you may know by now, putting wire and foundation in frames is really time consuming. Next is no chemicals and artificial feed. As this is the Lazy Beekeeping presentation, the main reasoning here is that it saves a lot of work. Who wants to go put something in, take it out, wear gloves, etc. etc. etc. Feeding is the same way. Making syrup and feeding it takes time and energy and it costs too. Next is carts. Easy on the back. I use the pickup or wheel barrow when possible, but I have thought about building a cart but have never gotten around to it. Leave the burr comb between boxes. The queen uses it as a ladder. Don't cut queen cells. Destroying queen cells a lot of times ends up causing queenlessness because the queen may have left or will be leaving soon anyway. Stop fighting your bees. How do you make your bees do whatever? Don't. Maybe fool them or stack the deck, but you can't make them do anything. Rule of thumb, if you're not sure what to do, don't do anything. Don't wrap hives, just seals in the moisture. Cold has a beneficial effect on bees. Further north means more honey. Don't make your hive a damp tomb. Stop painting your hives. According to Richard Taylor, the hives will last longer if you don't paint them. Mike disagrees. Stop switching hive bodies. Stops swarming, yes, by confusing things which is not productive. Don't look for the queen. Takes a lot of time and you can find anything you need to find without her usually. Don't wait. Not a good enough reason to wait between making the hive queenless and giving them a new one. Feed dry sugar, much quicker and easier and can do it in the winter. Split by the box. Much quicker making splits. Works much better with 8-frame mediums. Not so well with deeps. Michael Bush is probably the most well known beekeeper in America at this point, maybe the world. I don't know of anybody who is more well known. Mike is explaining a bunch of his methods, starting with upper entrances. These eliminate a bunch of problems, skunks, ventilation, ice, grass, snow, etc. Next is uniform frame size. I'm a proponent of this one as well. Interchabilty is fantastic. The utilitarian aspect should make this one high on your list. The lifting issue is good if you go to the lighter boxes. Here's your picture of Michael Bush HPM. Hey, there's Sam Comfort too. 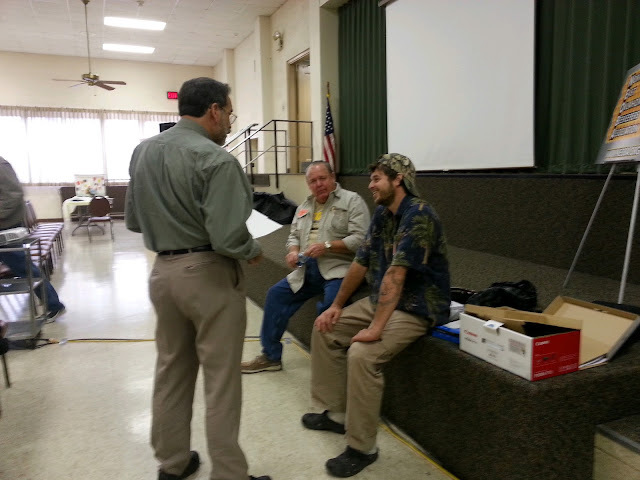 Ed Levi is a retired Arkansas State Bee Inspector. He's a yearly fixture at the Big Bee Buzz and he always has great talks with lots of good information and great slide shows. He started this evening's presentation by explaining how he doesn't treat his bees. He just doesn't. 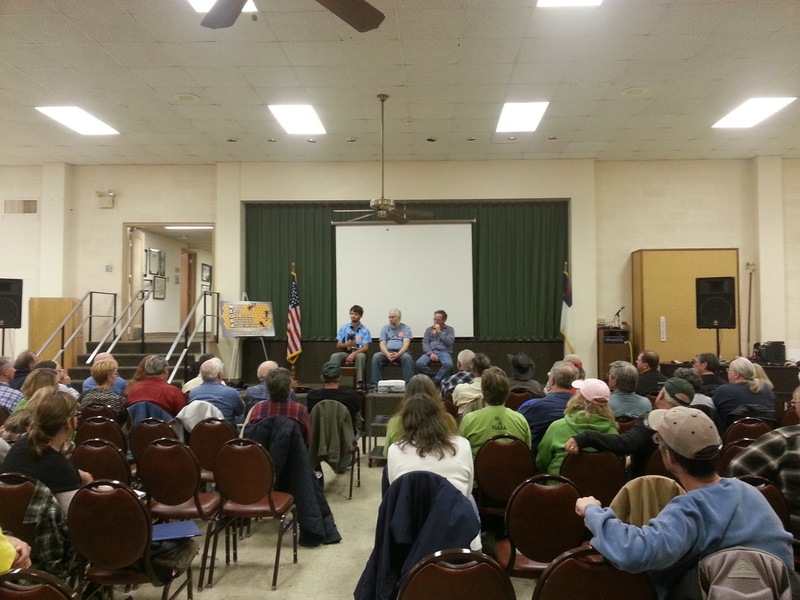 As a veteran beekeeper, he had a lot to say about the chemicals and their effects. He is a user of the very soft and mechanical methods. He takes a softer style IPM approach.He keeps track of his mite levels but he's not a hard Bond method beekeeeper. The Bond style refers to the "live and let die" sort of philosophy that I subscribe to.Compared to my methods, he is much more active, giving the bees much more help. He replaces his queens once a year. His losses are quite good, this year less than 8%. Let the Big Bee Buzz Begin! I walked in to my friend Neil's place, and there's Sam Comfort playing the piano! Great start to the weekend, getting the chance to sit down for a couple hours and talk to one of the few treatment free beekeepers around, at least the more visible ones. Michael Bush is here too. I'll take a picture of him to prove it later. Anyway, this thing is going to get started before long. I'm going to try to blog as much as I can about it because we have three fantastic speakers and they have a lot of good information. Stay tuned. I inspected my south yard yesterday and found a couple interesting things, one of which I have shown before. It's a hive that created its own dam of propolis across the entrance area presumably to act as an entrance reducer. That makes it one hive dead for this winter, a percentage loss of 4.3%. If you wave your hand over an open hive and bees fly up to sting it, requeen. The Big Bee Buzz has returned this year. It's the Northeast Okalhoma Beekeepers Association's yearly get together where they invite well known speakers to present on beekeeping topics. This year, they feature Michael Bush, Ed Levi, and Sam Comfort. And I'm going to be there. And I'm going to blog it. You should come too. I'd post a link, but I'm practicing blogging on my phone and it's a lot of work to get a link. But do a quick search and it's real easy to find. While I generally try to feed as little as possible. When I do need to feed, I am lately trying to avoid syrup because of all the problems it causes. So I feed granulated sugar. This hive above as you can see never really made it up into the second box. Being that this hive uses medium frames, a single box is not much. Normally I wouldn't be so concerned about a small hive like this, but I want to raise medium nucs this year. And while I don't need a medium hive to make queens for medium nucs, I do need brood on medium frames which means I need some medium hives to survive. So I took out half a dozen frames or so and laid a paper towel across the space and put a couple pounds of sugar in there. So you can see the result. The time to feed is naturally when all other options are off the table. It's early or mid winter and you can't feed syrup. Feeding is a last ditch effort to save a hive, not to prop it up, but to maintain its utility. These hives that I fed will not be used for honey production or breeding. For the most part, they will be split up to donate their brood to new hives which will be headed by queens bred from the best. If they are lucky, the queen and some brood will be placed in a nuc to draw comb for the spring and then probably killed either by summer or by being combined with some stronger hive. Much depends on each hive's spring performance. 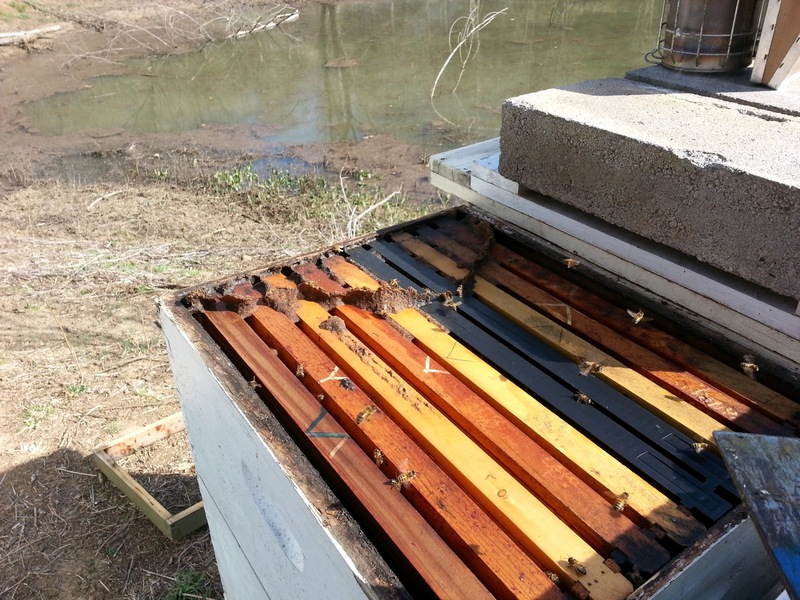 A solid spring can make up a little ground from a weak fall and winter, especially for a yearling hive. Check out this really sweet video. When starting out in beekeeping, there are a couple of options, the most reliable of which are buying bees. Sometimes if available, you can buy whole established hives, but they are expensive and rare. The main options are nucs and packages. A package is a bunch of bees in a screened box, usually 3 lbs. A queen is included in her own cage and a can of syrup is usually included too. These are made by dumping a bunch of random bees in a box and adding a queen. The queen is not related directly to the bees, and in fact have come from different hives. You know virtually nothing about either. Your confidence in the sale is directly related to your confidence in the seller. A nuc (or nucleus hive) is a small hive, usually five frames. If you have a quality seller, the queen will have been in the hive for a long enough period of time so that she has laid it full of brood and all the bees in the hive are her daughters and are representative of her genetics. A package will lose a significant portion of its population before a single new bee hatches. A nuc will have new bees hatching every day. It is already a fully functioning hive. It includes drawn comb. Understand, I'm not hyping nucs because I sell them. I do, but that kind of idea is backwards. I sell nucs because I strongly believe they are the best option for starting new hives. Well, the best option is splitting your own, but if you need to buy some, nucs are the best option. And that's why I sell them. If I thought packages were the best option, I would sell them. For a seller, packages are probably the best money making option. They cost very little in resources, essentially just bees in a screened box. And they tend to die about half the time in the hands of a new inexperienced beekeeper. So not only do you sell a cheap product for a significant chunk of money, your customers keep coming back because the product they bought keeps breaking. Well, there you have my view. If you have any other questions, I am happy to answer them.